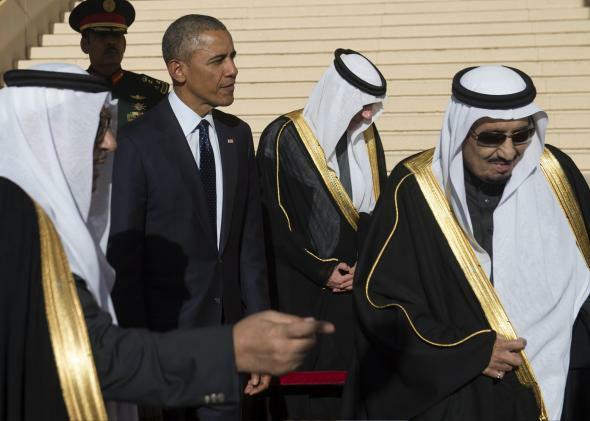 Don’t Read Too Much Into King Salman’s Snub of Obama. The U.S. and Saudi Arabia Are Still Stuck With Each Other. Don’t Read Too Much Into Salman’s Snub. The U.S. and Saudi Arabia Are Still Stuck With Each Other. Saudi new King Salman stands alongside U.S. President Barack Obama after the Obamas arrived on Air Force One at King Khalid International Airport in Riyadh on January 27, 2015. President Obama’s planned summit with heads of the Persian Gulf states at Camp David this week is going to be a lot less high-profile than planned. Leaders of the United Arab Emirates, Oman, and Bahrain, and most importantly, Saudi Arabia will not be attending the meeting. Obama had been hoping to hold a private meeting with Saudi Arabia’s new king, Salman, during the summit, so his non-attendance is being widely read as a major snub caused by Saudi displeasure over the administration’s Iran policy. I’m not sure it’s such a big deal. The Saudi delegation isn’t exactly low profile: Salman is sending Crown Prince Mohammed bin Nayef, the Saudi interior minister, and Deputy Crown Prince Mohammed bin Salman—those guys are next in line for the throne and very involved in national security issues. Still, the symbolism isn’t what the administration is hoping for as it seeks to sell skeptical regional allies on its proposed nuclear deal with Iran. The U.S. and Saudi Arabia are currently in a very strange sort of feud in which, despite clear differences, neither one ever criticizes the other. Publicly, Saudi Arabia has supported the Iran deal, despite having earlier expressed concerns about lifting sanctions on its main regional adversary. And while U.S. officials are clearly skeptical about Saudi Arabia’s ongoing military campaign in Yemen, official Washington is still supporting it. It’s true that, as one Saudi former diplomat tells the New York Times, “Just as the United States is trying to lessen its dependence on Saudi oil, the Saudis are trying to lessen as much as possible their reliance on the American alliance.” But if anything, the news that Saudi Arabia and the other Gulf states are demanding a new weapons system in exchange for their support of the Iran deal is a sign that the security relationship isn’t going anywhere. For now, no matter who shows up at Camp David or what is discussed, the U.S. and Saudi Arabia are still stuck with each other.